This morning, the 2011 Nobel Prize in Physics was awarded to Saul Permutter, Adam Riess, and Brian Schmidt. In 1998, two competing groups of astronomers were attempting to measure the rate at which the universe’s expansion was slowing. As Vesto Slipher and Edwin Hubble found in the 1920s, far galaxies are moving away from our galaxy at a rate more-or-less proportional to their distance. That was the beginning of observational cosmology, moving cosmology from philosophy departments into the realm of science. If the universe is expanding, running the clock back far enough would show a beginning point: the Big Bang. Einstein’s general theory of relativity provided the theoretical understanding of expansion: a universe that looks roughly the same everywhere and in every direction (homogeneous and isotropic being the technical terms) will either expand or contract. However, it could go several ways, depending on the total amount of stuff (matter, light, etc.) in the universe. Expansion battles gravity from the lumps of stuff inside the universe, which overall would have the effect of slowing down the expansion rate, so it was widely assumed that there would be some sort of deceleration going on, even if the universe would expand forever. Many astronomers set out to measure the deceleration rate. 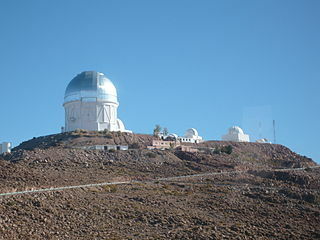 The Cerro Tololo International Observatory (CTIO), where the two rival teams of astronomers discovered the accelerated expansion of the Universe. Thus we come to 1998 and the two groups of astronomers: the High-z Supernova Search Team (an international collaboration led by Riess and Schmidt) and the Supernova Cosmology Project (headed by Perlmutter), both involving a lot of researchers to run the telescopes, make the observations, and analyze the data. (It’s truly a shame that the Nobel Prizes are limited to three people. Nobody with an ounce of knowledge of this kind of project would believe that only these three men did the work. I’m not impugning them at all, just saying that the tent should be big enough to encompass everyone involved.) As the names of the groups suggest, they used supernovas of a particular type: the explosion of a white dwarf. White dwarfs can only grow so large before gravity overwhelms the pressure holding them from collapse. This limit is known as the Chandrasekhar limit (for the great astrophysicist Subrahmanyan Chandrasekhar), and it’s the most massive any white dwarf can become. If enough mass is added to any white dwarf (from a companion star), it will explode in a similar fashion: a supernova of type Ia. The name comes from its spectrum, which makes it possible for scientists to distinguish white dwarf supernovas from the explosions of massive stars, which are not at all uniform in the way they explode. Astronomers know how bright these white dwarf explosions are, so if one happens in a distant galaxy, they can accurately determine how far that galaxy is from us. If the expansion of the universe was decelerating, then there would be slightly more supernovas at smaller distances than at larger. However, the supernova search teams found that there were slightly more supernovas at larger distances, indicating that the rate of expansion is growing. The universe is accelerating, and nobody has a good answer as to why. The name given to quantify our ignorance is “dark energy”; observations of the cosmic microwave background show that it comprises 72% of the energy content of the universe, compared with about 5% for ordinary matter and 23% for dark matter. Why dark energy is weird. 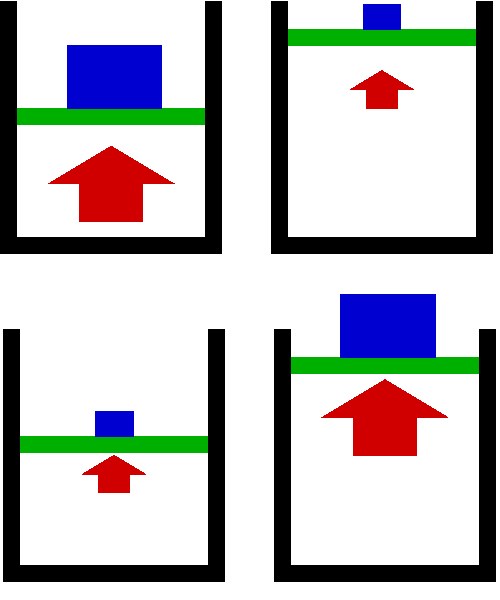 The top two pictures shows how normal gases behave: in a small volume, the gas is compressed and can support a large weight, while if the gas expands, its pressure decreases. The bottom two pictures show what happens if you could somehow confine dark energy: the smaller the volume, the smaller the pressure, while a large volume has a larger pressure. Strange as dark matter is, it still has the characteristics of matter: it collects together and behaves normally under gravitation. Dark energy doesn’t behave like anything normal: if you compress it, its pressure goes down, while if you let it expand, the pressure goes up. For this reason, many people associate it with vacuum energy: the energy of nothing, since the “more nothing” you have, the more energy you would have in that volume. It’s a good idea, and supported by quantum physics, except that the vacuum energy calculated is far too large compared with dark energy. However, the burden right now is not on the observers to decide what dark energy is, just how it behaves. The identity of dark energy is for theorists, and we’re behind the curve on that. So let’s focus on success today as we celebrate again the discovery of dark energy. Congratulations to Saul Permutter, Adam Riess, Brian Schmidt, and everyone whose hard work discovered one of the strangest phenomena in our wonderful universe! It is surprised to hear that the three U.S. physicists had won the Nobel Prize in physics for discovering through the study of supernovae that the universe is accelerating expansion. The Hubble’s redshift and the Doppler Effect are the facts. It doesn’t mean the universe is expansion or universe is accelerating expansion. The expansion of the universe is based on the true of the Big Bang theory. If the Big Bang theory is not true. Even though the Hubble’s redshift, and the Doppler Effect is the facts. The expansion or accelerating expansion of the universe is not supported. The Big Bang theory and “dark energy” are not just a crazy idea, it is nonsense. Is anyone believe the “dark energy” able to create the real energy to push the supernovae accelerating expansion? If you do believe it. You may believe “dark human” can turn spirit to a real person. In Scientific community , the Big Bang and ”dark energy” issue had been argue for so many year, And now act rashly to award the Nobel Prize in physics for the universe is accelerating expansion .I believe that someday will be proved the 2011 of the Nobel Prize for physics turn out to be a joke. The expansion of Universe should not true. If it is true, the Big Bang theory and “dark energy” will be true. Now raise a big question. If he Big Bang theory and “dark energy” are not true. Also the Hubble redshift, and the Doppler Effect is the facts, How could be proved the universe is not expansion or not accelerating expansion? The space of the universe has only three kind of possibility. One is Euclidean space, one is elliptical space and the other is hyperbolic space. These three kinds of space can only be hypnosis to be one of the three only, And, it cannot be identify by proved. 3. Remaining space is The Hyperbolic space. Let analyze, if supernovae happen in Hyperbolic space. Hubble’s laws are derived from Euclidean rules and Euclidean formulas. However, assume the Universe is in Hyperbolic space. Very logically, we must derive its rules and formulas from Hyperbolic rules and non-Euclidean formulas. The rules and formulas of Hyperbolic space are quite different from Euclidean space. Hence, the results derived from utilizing these two systems must be different. These differences may be the keys to unveil the mystery of the Universe. Comparing equations (1) and (2), we can see very obviously that the area of the light spherical fronts is very much different. Even though they have the same radius. Therefore, the Doppler Effect should not be the same between Euclidean space and Hyperbolic space. The area of the Light Spherical Front in Euclidean space is 4πr2. What is the area of the Light Spherical Front in Hyperbolic space? Let PQ be the chord of a circle of radius r, which subtends an angleθ, M be the midpoint of the chord, and O be the center of the circle. Then, let ds are the length of the arc of the spherical circle, and r be the radius. When a photon travels a distance r, the area of the Light Spherical Front in Euclidean space is 4πr2. Compare the two Spherical Areas in the two different spaces with the same r. We easily to see that, if we are in Hyperbolic universe, Light Spherical Front stretch from 4πr 2 to 4πk 2 sinh2 r/k. We temporary called this stretch by “Liou’s stretch effect”. The Spherical Front of photon may only travel a distance r in Hyperbolic space. But in Euclidean space, it appears to travel a distance of k sinh r/k. From the difference of r and k sinh r/k in Euclidean space, it looks like the object moves from point r to point k sinh r/k, but the object actually stays still in Hyperbolic universe. When we use Redshift of Doppler Effect in Euclidean space to calculate velocity of galaxy from point r to point k sinh r/k. Actually, there is no movement from point r to point k sinh r/k. It only cause by the stretch of curvature of Hyperbolic space (“Liou’s stretch effect”). I will use the velocity to calculate the space constant (cosmological constant). Use redshift of frequency the result is the same. Where s is the distant of galaxy moving from position r to the position k sinh r/k. where ds/dt =v (the velocity of galaxies at the remote distance of r), and dr/dt is the speed of light c.
There are several versions of the Hubble’s constant. We will select the one most popular one. In which, the velocity of galaxies at a distance of six billion light-years move away at a velocity of roughly 90,000 kilometers/sec. Hence v=90,000 kilometers/sec and r=6 bly. v = 90,000 kilometers/sec and r = 6 bly. Where bly is billion light-years. 1. Hubble’s constant was not constant. From equation (3), v = 2c sinh2 r/2k , the velocity of galaxies and the remote distance of r were not exactly linear proportions in Euclidean universe. The velocity is more likely in slightly acceleration observed in Euclidean universe. Assuming k = 7.931965828 bly is correct; the Hubble’s diagram in Euclidean space should look like the following diagram. From this chart, we should call Hubble’s accelerator instead of Hubble’s constant. 2. Is Universe’s redshift cause by DOPPLER EFFECT or “LIOU’S STRETCH EFFECT”? From Hubble’s Law, the speed by which a galaxy moves away is proportional to the distance to the galaxy. A galaxy with distance of 6 bly has a velocity of 90,000 km/s. For a galaxy 30 bly away, its speed will be 450,000 km/s. This is beyond the speed of light a lot. It is contradict to the fact of the speed of light is constant. In recent year, astronomer’s observed that Hubble’s constant is not constant. The galaxies actually moving away accelerated, like supernovae. From this two facts, the Universe’s redshift is more likely to be caused by the “LIOU’S STRETCH EFFECT”.
. And Doppler Effect caused by the STRETCH of the Hyperbolic space (“LIOU’S STRETCH EFFECT”) not by the speed of velocity in Euclidean space. So, the universe is not expansion nor accelerating expansion. Even though Hubble’s redshift and the Doppler effect are the facts. In other words, the universe is still in Hyperbolic space. We can forget about Big Bang Theory, dark matter, dark energy, block hole, white hole etc. By the way, if anyone can prove the sum of the angles of three galaxies are less than two right angles. I will award 100000 USD. The observation of type Ia supernovae showed that the cosmological redshift of distant galaxies does not comply with the calculations on the basis of the Doppler effect (the Big Bang theory) and is subject to exponential law of damped oscillations, where the Hubble constant represents parameter of the attenuation electromagnetic oscillations. That is to say that Hubble constant – is quantum amount by which photon’s frequency decreases in one period of oscillation. To determine by how much the frequency of the photon has decreased, the Hubble constant must be multiplied by the number of the committed oscillations that is completely consistent with the results obtained by the modern method of “standard candles” (Nobel Prize 2011).